By 1980, the Grateful Dead were not exactly viewed as being on the cutting edge of the music industry. The prevailing punk/new wave movement represented a rejection of everything the Grateful Dead seemingly stood for, from hippies to “peace and love” to long guitar solos. They also had little in common with the rock mainstream, which was dominated by the likes of REO Speedwagon, Billy Joel, Queen and Christopher Cross. But as the Dead began their 15th anniversary year, they were still going strong and actually gaining in popularity with each passing tour. WTF? Not that they were actually averse to achieving “big-time success.” Like their first two Arista albums, the record they put out at the end of April 1980--Go to Heaven--had a certain commercial sheen to it, this time courtesy of British producer Gary Lyons (Foreigner, The Outlaws). Lyons worked the band hard in the studio--requiring nearly a hundred takes of “Althea” over a few months, for example--and Arista boss Clive Davis made no secret of his belief that the Dead really could have a hit record. He even wondered if a pair of songs by new keyboardist Brent Mydland might be the ticket to the Dead crossing over into more commercial realms. Garcia and Weir made themselves available for interviews pushing the new record, and, as part of the early promotion for the album, on April 5 the Dead made their second appearance on Saturday Night Live--a show positively infested with Dead fans, from John Belushi and Dan Aykroyd to writer/performers Al Franken and Tom Davis. The Dead acquitted themselves reasonably well with peppy versions of “Alabama Getaway” (the first single) and “Saint of Circumstance,” with Bob Weir wearing bunny ears to mark the arrival of Easter that Sunday morning--what a guy! Actually, the tour wasn’t “mostly” new material, but the songs from Go to Heaven did get a good workout, with “Althea,” “Lost Sailor,” “Saint of Circumstance,” “Feel Like A Stranger” and “Alabama Getaway” turning up at most tour stops, and Brent usually chiming in with either “Easy To Love You” or “Far From Me.” The months in the studio perfecting arrangements gave the new tunes a little extra zip, and the infusion of new tunes coupled with Brent’s continuing growth within the band, seemed to carry over to the rest of the repertoire. The first half of 1980 doesn’t get nearly as much attention as the second half of the year, which is known and loved primarily for the multi-night fall series at the Warfield in SF and Radio City in NY featuring both acoustic and electric sets, immortalized on the 1981 live albums Reckoning and Dead Set. But the fact is, the Spring ’80 tour is filled with well-played, high energy shows, including the two represented here from successive night in early May at Penn State (5/6) and Cornell (5/7). Historically, college campuses had long proven to be fertile “recruiting” grounds for Dead Heads. There was something about that environment: kids away from their parents, many of them discovering who they really are as individuals for the first time, open to new people, being exposed to unusual things, seeking novelty and adventure at every turn… why, it was a perfect fit (at least for some)! On a tour that was moving methodically up the eastern seaboard to big arena shows in Hartford, Boston and Nassau (Long Island,: three nights! 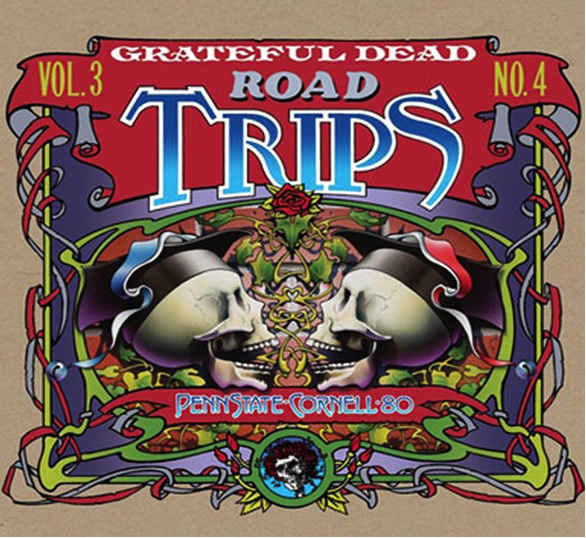 ), playing Penn State and Cornell let the band go to place that were a bit off the beaten track but still loaded with potential Dead Heads. Besides, the group had a track record in each place: They had played Penn State’s Recreation hall a year earlier (5/8/79; the Garcia Band played there in December 1977), and Barton hall at Cornell (in upstate Ithaca, NY) had been the site of one of the most revered shows in Dead history on 5/8/77--although it is almost entirely since 1980, with the widespread proliferation of tape trading, that the Cornell ’77 show gained its (deserved) near-mythic status. The folks who went to the show with open ears got a helluva ride for their 12 bucks. The first set (some of which appears on Disc One, along with some selections from the Cornell first set) included standout versions of three Weir-sung diptychs--”Me & My Uncle” > “Big River,” “Lazy Lightning” > “Supplication” and “Lost Sailor” > “Saint of Circumstance,” as well as nicely rendered versions of “Loser” and “Althea” (among others). But it’s the second set (presented in its entirety, save for the encore, which is cut on the master tape) that provides most of the fireworks, including a truly electric “China Cat” > “I Know You Rider,” a flawed but spacey-cool “Feel Like A Stranger,” a version of “The Other One” that is surely among the best of the early ‘80s, a moving and powerful “Wharf Rat” out of “Space,” and then a bang-up rock ‘n’ roll close, which the Daily Collegian writer called a “second-half peak [that] nearly tore the place apart.” He got that right. Immediately following the Penn State show, the road crew most likely loaded up the equipment truck and drove the nearly four hours it would’ve taken to make it from State College, PA, to Ithaca, NY, probably arriving right before dawn, to set up for that night’s show. Barton Hall is another venerable facility, with a Gothic-style exterior, built during World War I as a military ROTC training facility. Later it became a center for indoor sports such as track and field and was used for various other gatherings, including concerts. The cavernous room has huge pyramidal windows at each end, a pitched steel-framed roof and more windows below the roofline running along the sides of the building. Despite its size, the capacity was just a little more than 7,000--for the Dead’s return there, nearly three years to the day after their ’77 triumph, the place was SRO, with a top ticket of just $8.50. And so it was on two nights in May of 1980… and then 1,121 others that followed over the next 15 years of the Long, Strange Trip. This album was released in September 2010.